Savor these rich images, valuable for street photographers and those wishing to keep alive the memory of 1980s New York. 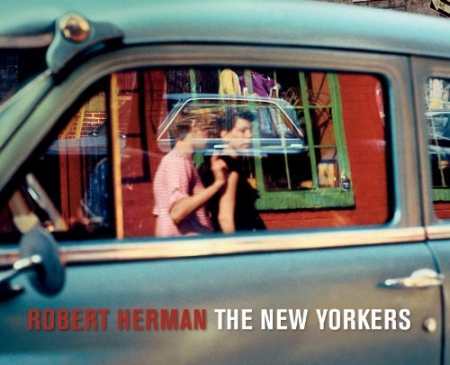 Robert Herman’s The New Yorkers is as much an historical document as it is art. It records a time in American history both by showing what people and culture looked like in the early 1980s and by presenting an aesthetic of that time. In the age of cell phone cameras, where imaging has become conversation, it is easy to forget the relative rarity of well made photographs from the last century. Unlike today, in 1982 a camera on the street drew attention—making Herman’s captures all the more pure for the lack of posturing for the camera. Robert Herman’s collection is easily compared to the now exalted work, The Americans by Robert Frank. Herman’s work is not imitative as much as it is a reaction to or micro-view of New York through the narrative style that Frank brought to photography. Certainly Herman knew of Frank’s work when he was making the photographs in The New Yorkers, but in 1980 The Americans had not gotten the full universal acceptance and regard it developed in the last twenty years, becoming a basic text for street photographers. Walker Evans influenced Frank. Frank influenced Herman. All of this would be interesting, albeit unimportant, if Herman’s photographs did not stand alone. They do. The 128-page collection shows us a New York that is fading in memory. His photographs take us into corners and alleys that were not preserved by the recorded media of the day. His vision is to capture those small, everyday things that define and describe the time. He sees and records the nuances of life that his contemporaries walked right by, often turning their heads to avoid seeing. Anyone who spent time in New York in the early 1980s will see truth in these images rarely described by history. The images are honest in a way only photographs made before Photoshop can be. Herman uses light and shadow to create tension and reveal the mood of the New York street. His frequent capturing of reflections and glances caught through windows or just beyond moving pedestrians gives the still photographs the active feel of a city on the move. “Closed Sunday,” brings to mind Hopper’s “Nighthawks,” but in an even darker and more foreboding way. The photographs use color, or the absence of it, to show human struggles for attention in a world of gray concrete. One example, “Sylvette and Smithereens,” sees a brightly painted van against the monochromatic buildings rising from the pavement. New things can be discovered each time a viewer enters the The New Yorkers. It’s a rich gallery of images that takes time to fully digest and appreciate. It will be an important addition to any collection of photography volumes. Herman’s work is instructive for other street photographers and just as valuable for anyone who is fascinated by the city of New York and the people who live there.